The US investment boom of 1995-2000 drew many younger and less-educated prime-age workers into employment. After attaining a peak in 2000, the ratio of employment to the population of these workers declined during the jobless recovery of 2000-2007 and dipped further during the Great Recession of 2007-2009. The decline in the labour force participation of prime-age workers has been widely discussed, for example, by the Council of Economic Advisers (2016). Are the lower employment rates of younger and less-educated workers a ‘new normal’ that will persist for some time? Or, will the continuing economic recovery enable these workers to resume the higher employment rates that prevailed before the Great Recession? To answer these questions, in this column we present detailed data on employment rates by age, gender, and education for the US labour force from a recent paper (Jorgenson et al. 2016). To assess the prospects for the recovery of employment as a potential source for the revival in US economic growth, we project employment rates by age-gender-education groups for the period 2014-2024. We then project the rate of US economic growth for this period. We find that the US economy will grow 2.5% per year. This exceeds economic growth during the quarter century 1990-2014 of 2.3%. The increase in US economic growth will be mainly due to more rapid growth of employment, especially for younger and less-educated workers. We find that the employment rates for the younger and less-educated prime-age workers are likely to reach the levels that preceded the Great Recession. However, these employment rates are unlikely to attain the peak levels that followed the end of the investment boom of 1995-2000. We conclude that the recovery of employment to population ratios could provide an important opportunity for the revival of US economic growth. 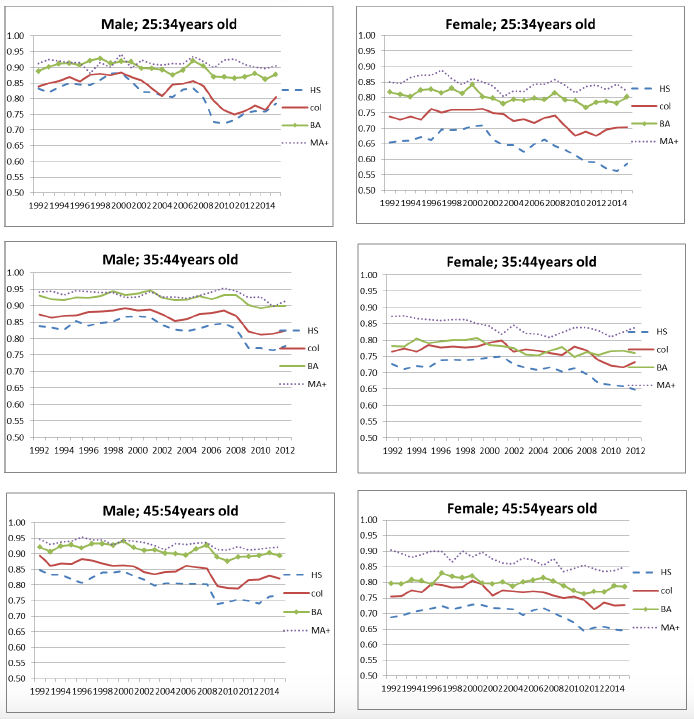 In Figure 1 we present data on employment to population ratios for the period 1992-2014 for males and females of three prime-age groups: 25-34, 35-44, and 45-54 years old. We find that the employment to population ratio for each age-gender category increases with educational attainment. Better-educated workers are much more likely to be employed for all three age groups and for both males and females. For example, male workers with BA degrees have very high employment rates for all years except the recessions. Employment rates for males with only high school diplomas are substantially lower. The relationships between employment rates and educational attainment for female workers are similar to those for males. We project the size of the labour force for the next decade, 2014-2024, from the growth and composition of the population. We then project the future growth of educational attainment of age cohorts of the population as they enter the labour force and the future increase in experience as these cohorts age. Finally, we project employment to population ratios for each age-gender-education category of the labour force by modelling past trends. We next consider the growth of labour input.1 Labour input incorporates the education and experience of workers, as well as the hours that they work. We define labour quality as the ratio of labour input to hours worked. We find that labour input will increase more rapidly during 2014-2024 than during the historical period 1990-2014. 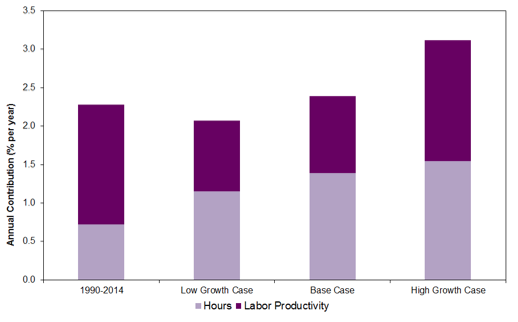 While labour quality will grow more slowly, the growth of hours worked will be much faster. While much attention has been devoted to the aging of the labour force and the ongoing retirement of the baby boomers, the looming plateau in educational attainment has been overlooked. Average levels of educational attainment of the people entering the labour force will remain high, but will no longer continue to rise. Growing educational attainment will gradually disappear as a source of US economic growth. In projecting the future growth of the US economy we employ the methodology of Jorgenson et al. (2008). We combine our projections of the future growth of labour input with projections of total factor productivity, defined as the ratio of output to input, where input includes both capital and labour inputs.2 We then determine the future growth rates of output and capital input that are consistent with these projections of labour input and productivity and with the assumption that output and capital stock grow at similar rates. In our paper, we present a new data set on the growth of US output and productivity by industry for the post-war period 1947-2014 (Jorgenson et al. 2016). This data set includes outputs for the 65 industries represented in the US National Income and Product Accounts (NIPAs), as well as inputs of capital (K), labour (L), energy (E), materials (M), and services (S), resulting in the acronym KLEMS for these inputs. The key indicator of the rate of innovation for each industry is the growth rate of total factor productivity, where productivity is defined as the ratio of output to input. Figure 2 includes three alternative projections of productivity growth for the period 2014-2024. 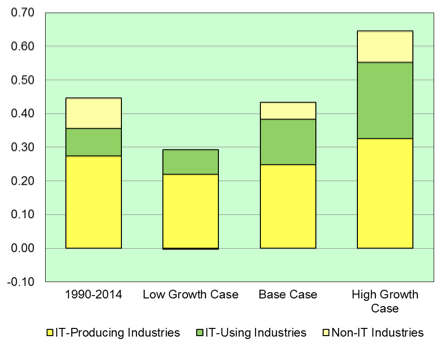 For the Base Case we set future productivity growth rates for IT-producing, IT-using and Non-IT industries equal to growth rates for the period of growth and recession, 1995-2014. The Low Growth projection is based on productivity growth rates for the period 1973-2014, including the long slump of 1973-1995. The High Growth projection incorporates productivity growth rates for the recent period, 1995-2007, including the investment boom of 1995-2000 and the jobless recovery of 2000-2007. We find that US economic growth will continue to recover from the Great Recession of 2007-2009 through the resumption of growth in productivity and labour input. Rapid growth of hours worked in our Base Case projection is mainly due to the recovery of the ratios of employment to population for younger and less-educated workers. 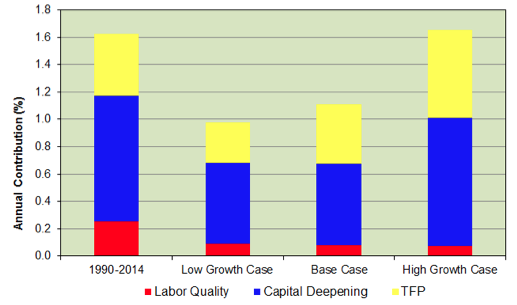 This reduces the projected growth of capital deepening – that is, the ratio of capital input to hours worked. Projected growth of total factor productivity in the Base Case will be insufficient to revive the growth rate of average labour productivity. Fernald (2016) analyses the growth of potential output and productivity before, during, and after the Great Recession. He reaches the conclusion that half the shortfall in the rate of growth of output, relative to pre-recession trends, is due to slower growth in potential output. His central projection of 1.6% growth for the next decade is considerably below our projection of 2.5% in Figure 4. Baily and Montalbano (2016) provide a survey of recent projections of US economic growth. Our projections are consistent with the perspective of Jorgenson et al. (2008), who showed that the peak growth rates of the investment boom of 1995-2000 were not sustainable. The slowdown in the growth in average labour productivity will continue during the decade, 2014-2024. However, the recovery of ratios of employment to population, especially for younger and less-educated workers, will lead to a revival of US economic growth. Authors’ note: The views expressed in this paper are solely those of the authors and not necessarily those of the US Bureau of Economic Analysis or the US Department of Commerce. Baily, M N and N Montalbano (2016) “Why is US productivity growth so slow? Possible explanations and policy responses”, Hutchins Center, Working Paper No 22, The Brookings Institution, Washington, DC. Barro, R J (2016) “The job-filled non-recovery”, presented at the Conference on The productivity puzzle: How can we speed up the growth of the economy? The Brookings Institution, Washington, DC. Fernald, J (2016) “Reassessing longer-run US economic growth: How slow?” Federal Reserve Bank of San Francisco, Working paper no 16-18, August. Jorgenson, D W, M S Ho and J Samuels (2016) “Education, participation, and the revival of US economic growth”, NBER, Working Paper No 22453. Jorgenson, D W, M S Ho and K J Stiroh (2008) “A retrospective look at the US productivity growth resurgence”, Journal of Economic Perspectives, 22(1): 3-24. Our measures of labour input are discussed in Jorgenson et al (2016). We define output as GDP; our measure of capital input is discussed in Jorgenson et al (2016). Further details about these projections are given in Jorgenson et al (2016). Barro (2016) discusses the recovery of employment.